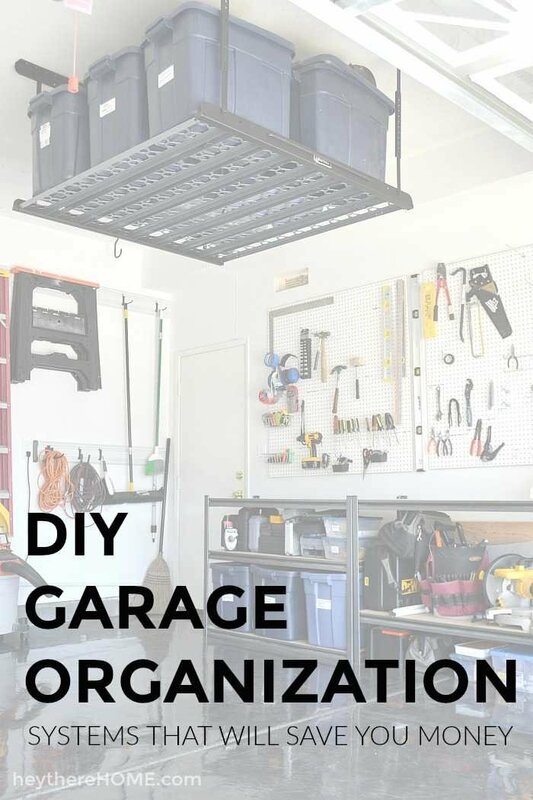 Inside: DIY garage organization systems that will help you organize your garage on a budget. 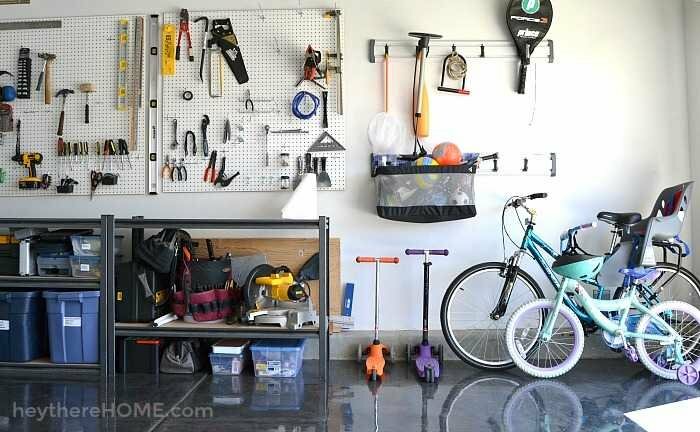 Do you remember how terribly unorganized our garage was a few months back when we started our DIY garage makeover? 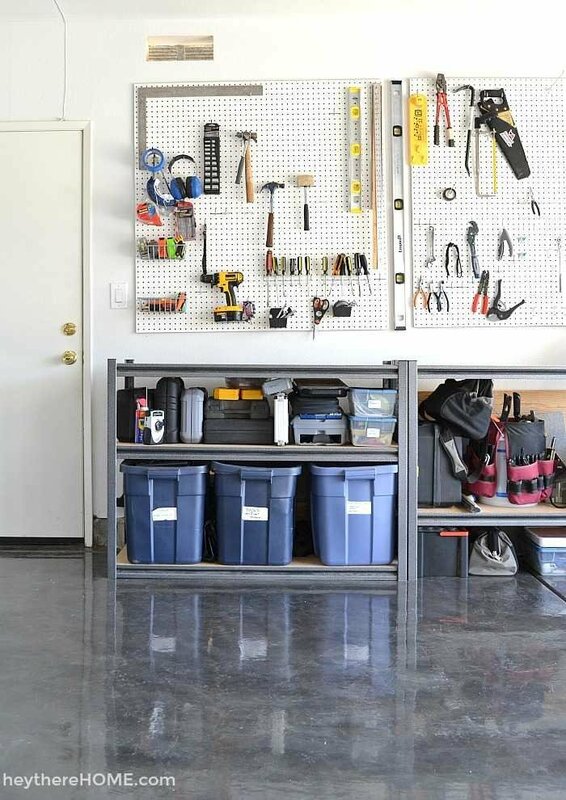 We’d attempted to gather and implement garage organization ideas over the years but kept falling short. Our garage had become a dumping ground. 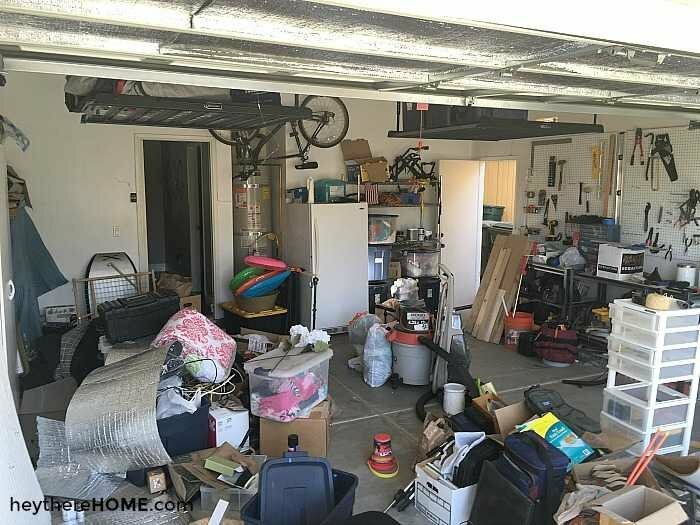 We’d even installed an overhead garage storage system and cabinets but still, everything just ended up in the middle of the garage. So I set a goal to be able to park my car in the garage last year, and I’m well aware that I’m a few months late on that promise to myself, but I didn’t give up. I worked through the garage one small area at a time using my declutter method and now I literally get a smile on my face every time I pull into my driveway, open my garage door, and pull into our (officially) organized garage! You know you’re mature when this sort of thing gets you all sorts of excited right? We now have a place to do our projects and tons of storage for all of our tools and supplies. And the kids can easily grab their bikes and toys. But the best part? I don’t cringe every time I go out here to get something out of the freezer. Yep. This girl’s dreams (well at least one of them) has come true. Track Storage System: We used the track system on the walls. 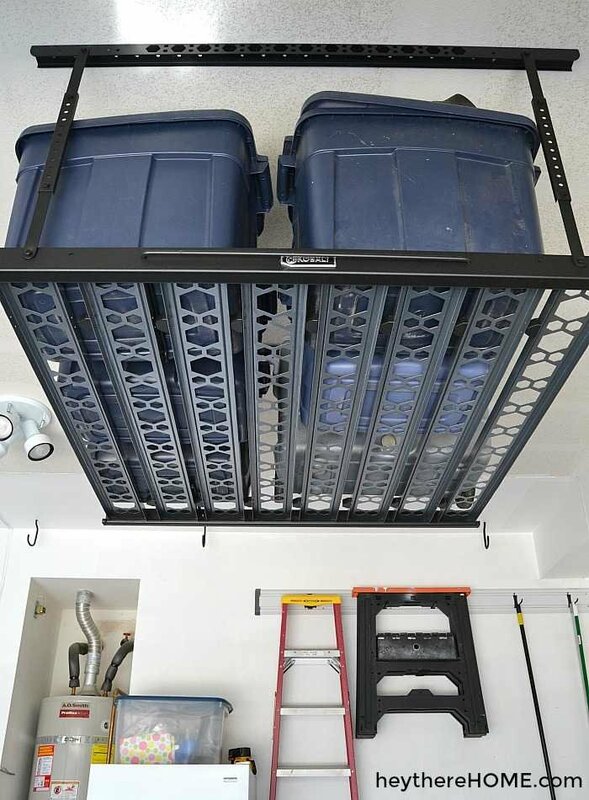 Overhead Garage Storage System: We installed this ourselves and were surprised how easy it was. Workbenches: We used shelves like these to create these lower work surface areas. You can get these with 4 or 5 shelves but be sure that they come with post couplers so you can split them apart for 2 lower units. To be able to grab small tools quickly, we attached pieces of white peg board to the wall. Then we used peg board tool hooks to hang our tools onto the wall. They literally make a hook for every kind of tool including a special hook for your cordless drill and a peggable basket for other odds and ends like measuring tapes. We keep larger tools on the shelves of these simple workbenches in their containers or in large rubbermaid tubs. We debated on hanging the bikes up on the wall, but our reality is that the bikes go in and out of the garage all day long and we wanted the kids to be able to grab them themselves. So we kept a space on the floor near their sports equipment and toys clear for bike and scooter parking. For their sports equipment and toys we used a track system to keep everything organized and within reach. My absolute favorite thing is this ball basket. It makes grabbing what we need on the way to practice or on our way out to the park so easy. 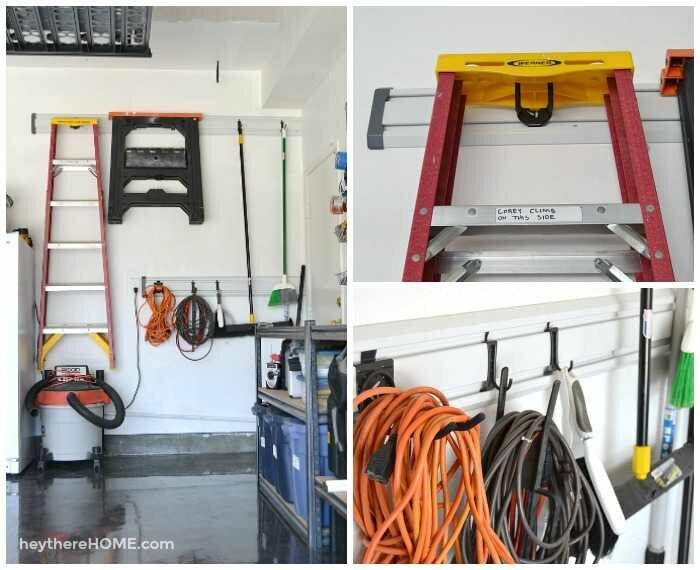 Mounting overhead racks in the garage was one of the first things we did to get the garage under control. 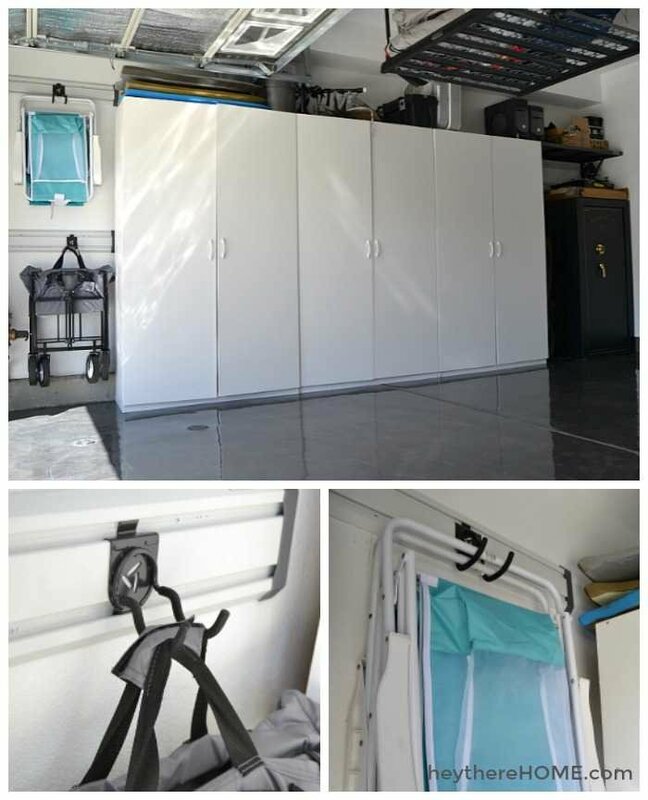 We were really surprised how easy these were to install and they’re a great place to store our seasonal gear and camping gear. They definitely clear up a ton of floor space in the garage and are high enough that we can still walk under them without a problem, something I was worried about. We used these ones, but you can find similar ones here. We continued the track system on this back wall to organize and store larger items like our ladder and the saw horses. These tracks are also a great for smaller things that we grab and use often like brooms and extension cords. We used pantry cabinets along the opposite wall which gave us a great place to store all of our paint, paint supplies, car related stuff, and some of my husband’s work gear. We also installed a heavy duty shelf on one end cause we needed a place to store heavy things that my husband uses for his job. This heavy duty shelf can hold up to 100 lbs. and was also a simple DIY installation. 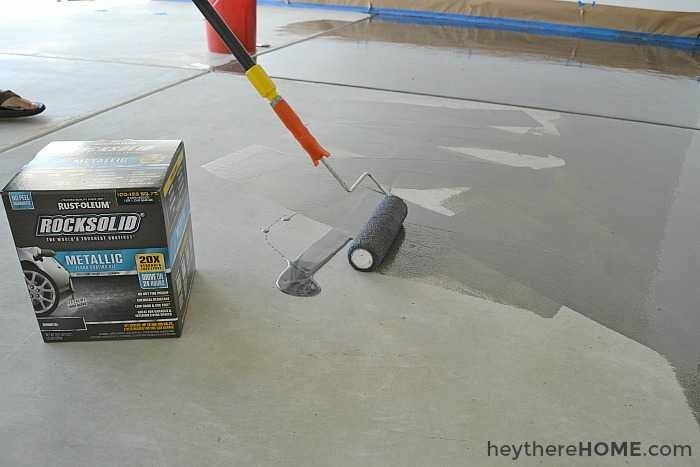 The icing on the cake to this DIY garage makeover is definitely the garage floor paint that kicked off the whole project. Again, it would have cost us a fortune to have this done professionally and we were really excited to try out Rust-Oleum’s garage floor paint. It was a relatively easy project (besides clearing everything out) but it forced us to go through everything and we finally have an organized garage that I think will finally stay that way! And the shiny gun metal grey floor makes it so easy to sweep up dust and project messes and looks so good! Plus you can see this little genius gadget we installed that makes getting into the garage so much easier. If you’ve been putting off getting your garage under control, I have to say, it is so worth tackling. Looks great! 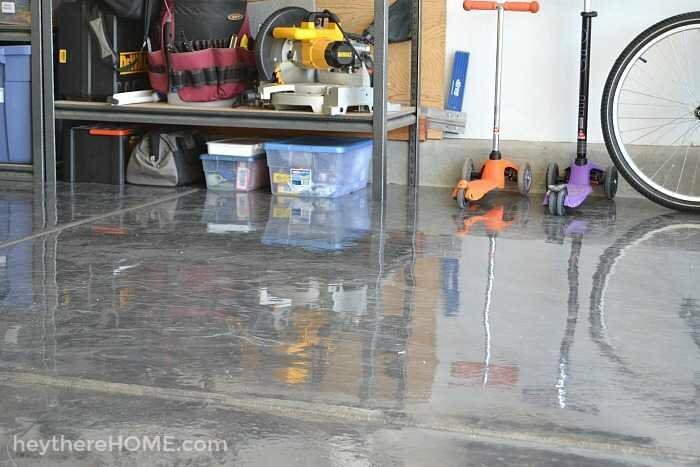 Is your new garage floor slick at all, when dry or wet? Hey Lindsay, Great question. It does get a little slippery. It’s even a little slippery if you’re just wearing socks. 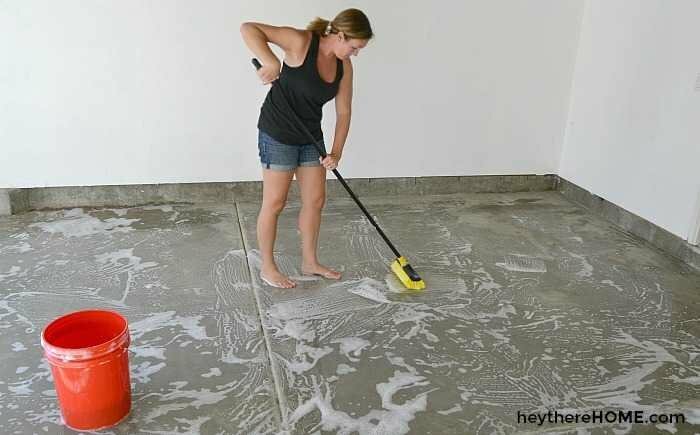 If you live in a wet climate, I’d pick a floor coating that has some texture to it to avoid the slippage. Hi Corey. Your garage looks great. Thanks for all the the advise on how to do a project like this. I don´t have a garage, but will be organizing a room for my tools, bikes and my photography gear. You’re so welcome, Jorge. Good luck on your project! 1. The pegboard – how large is yours? They come in so many different sizes! 2. 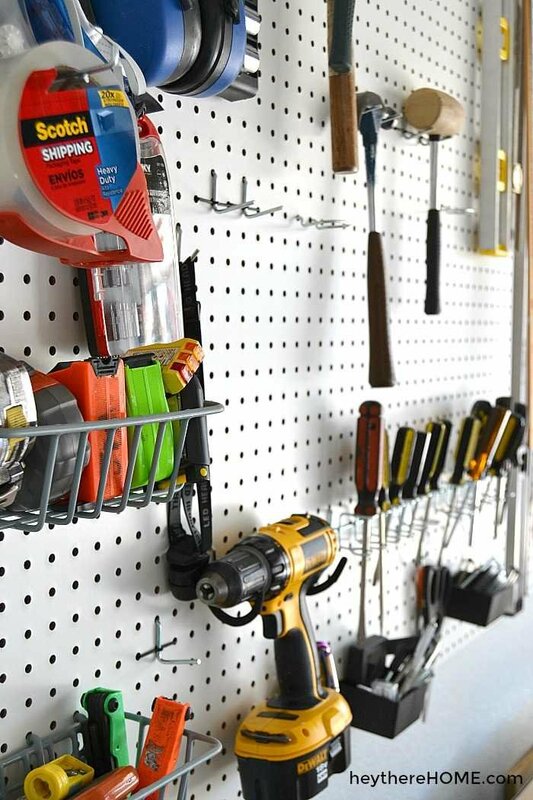 The small utility shelves underneath the pegboard – do you know the company or dimensions of yours? 3. Hooks for track system and pegboards – trying to decide if it’s best to order the variety packs or individual hooks. Any recommendations there? I guess I’m worried that with the variety packs there will be unnecessary hooks. Do you remember what you ordered? 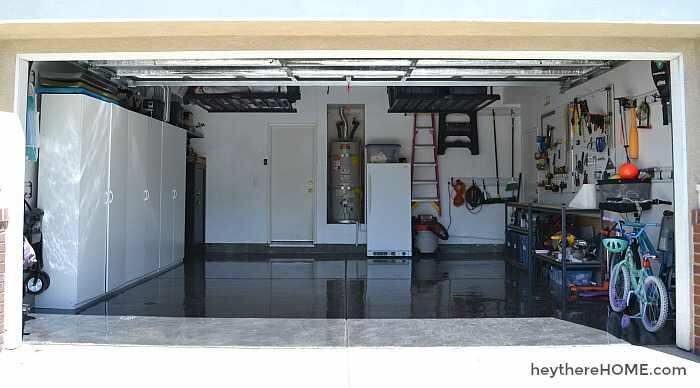 Is there anything you’d do differently now that your garage is complete? Hi Teresa, thanks for the great questions! 2. There is no logo on our workbenches and we got them a long time ago, but I see them often. A good place to check is Costco or Amazon, but definitely make sure that you have the flexibility to make one tall shelf or 2 lower shelves. You’ll want the shelf to come with “couplers” which will mean that you can split the shelf. This link will take you to all of the shelves with couplers. 3. We did get a variety pack and then also got some individual ones for things like our drill. It’s best to make a list of what you want to hang and then find the best variety pack. Then you can get the individual ones as needed. I love our garage!!! It was a huge pain in the bum-bum to get started because it had gotten so bad, but I’m so glad we tackled it. It’s so easy for the kids to go in and grab their bikes, it’s so easy for me to do a project because I know where everything is and getting things out and cleaning up is fast now that everything has a place. The only thing it’s still missing is more electrical outlets, which we will have to invest in an electrician for so that’s definitely in the plan. One of my favorite things is the overhead storage racks. So great to put stuff we don’t use all the time up there out of the way. Happy organizing! We’d love to see before and after pics of your progress! This garage turned out great! We love the new floor color. Exactly which storage shelves did you use for the workbenches? You give me hope!!! I’m working on my garage now. Hope it looks as good as yours when I’m done!!!! This turned out great! 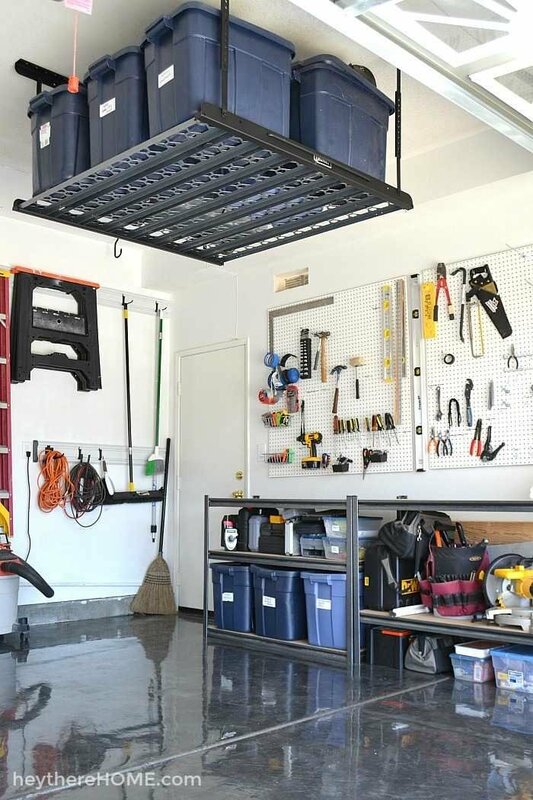 I would love to have just a couple of the organizing items for the garage in the home we’re purchasing. I love organization, and want to find tools that I want to use as well. I will help my husband with having a super workshop. Thanks! You’re so welcome, Robin. Glad you found it helpful! WOW what a transformation!! I think I matured very early because I’ve always loved stuff like this, lol. It must feel so good to have this all under control! We are (literally right now after this mini-break) finishing up an entryway makeover which will really help us organize a lot. Next up, the basement (it’s a total disaster). Did you keep track of what you spent? 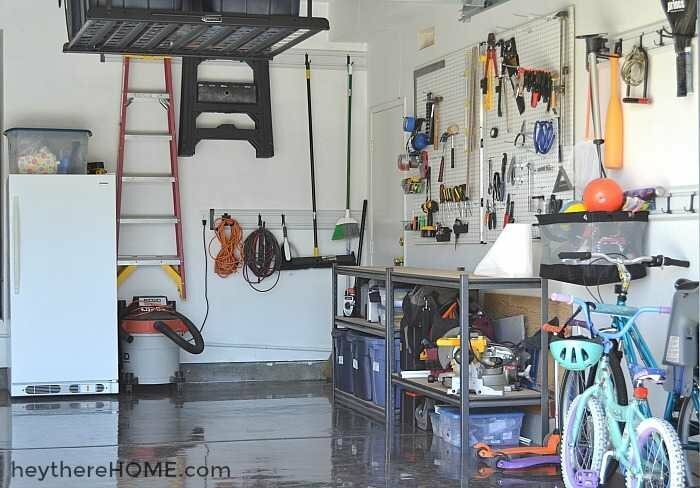 Seems like you already had those overhead storage shelves and the white cabinets and pegboard (at least I saw them in the first unorganized garage pix). Just wondered how much a storage transformation like this would cost for diy. I think we spent about 1k but you are right, Michelle, we did it in 2 phases. The first phase was purchasing the cabinets, overhead racks, and the peg board and the second phase was to do the floor and add the heavy duty shelf and track system. It would have been much more had we hired a company to install the overhead racks and do the floor. We had the floor quoted when we bought our house and it would have cost $1200 to hire it out. So overall we saved a ton of money by finding DIY solutions and they were all surprisingly easy. Great question, thanks for stopping by! Look a awesome. I bet your hubby did a lot of the work! You should praise him tonight! You’re so right, Sheila! Thanks for being part of the Hey There Home family!